Naruto 484 is out! TEAM SEVEN BIG REUNION! “TEAM SEVEN” Nauto manga chapter 484 has been out for a few hours. Both Naruto and Bleach has descent action and descent plot this week. Yahoo! Suddenly my heart jumped out of my chest. A loud music took over my place, took over the street, and took over my mind and my heart. I smiled. I couldn’t believe it, it was Naruto’s second season opening theme, it was alive music, and perfectly done. Good old days. I forgot how much I have enjoyed the anime in old days, and how much I like themes as the opening of the first and second, six and seven season. I forgot the fun I had at Shannaro 2 years ago… Time goes fast… But it may me think… there is amazingly good people out there… everywhere… honest mined, nice, smart, clumsy, pure hearted people with different ideals, religions, nationalities… Lol is not like you are good because you like Naruto, is just that I met great people cause of the manga and the anime. Wow. It was real. The music I heard. An anime – manga fun club made a party next to my house. In this small country, out the world, there are also manga’s fans. Yeah they are crazy follower of Naruto, Bleach, One Piece and many others that I don’t recall. They are like Shannaro’s ppl, but they met once in awhile. They are more or less 30 or 40 people from 13 to 40 years old or more, I didn’t dare to ask. Some are even married couples. 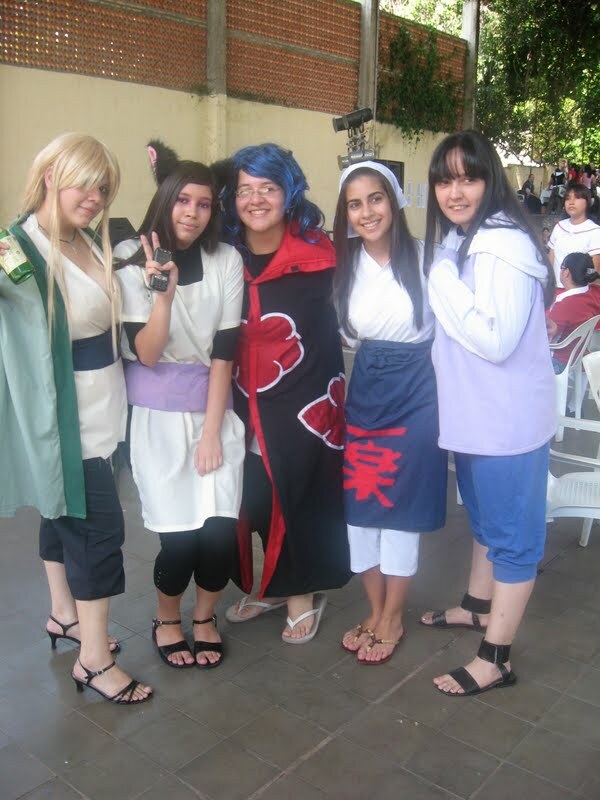 They colosplay, play games, do alive music copied from anime, and exchange books and merchandising. And I have to say it, the costumes are not as those we see in the net, but the music was amazingly beautiful, and people were truly nice. Simply: a bunch of happy people. You could not tell them apart, younger, elders, professionals, students, girls, boys, from different places and social classes. ROLF they weren’t any ashamed of walking the street in those crazy costumes. They have nicknames off course, mostly taken from manga characters. I girl called Gaara was pretty dressed in a pink. It is good to act like a child once in awhile, no matter your age. Somehow this reminds me that this word is great. We are so different, but we all love, suffer and dream. Like Naruto brings us all together, there are other beautiful things that made people join causes beyond the differences. This world is worth fighting for, just to keep alive the possibility of seeing tomorrow some people smiling, crying, going on. I made up my mind, I know what to write now. Let’s keep people with the chance of making mistakes in democracy, no matter if it is Danzou the one ruling now. I have to walk back to reality. PSD I will add pictures if I have a change. NARUTO MANGA CHAPTER 479 IS OUT !!! NARUTO MANGA CHAP 476 IS OUT !!! 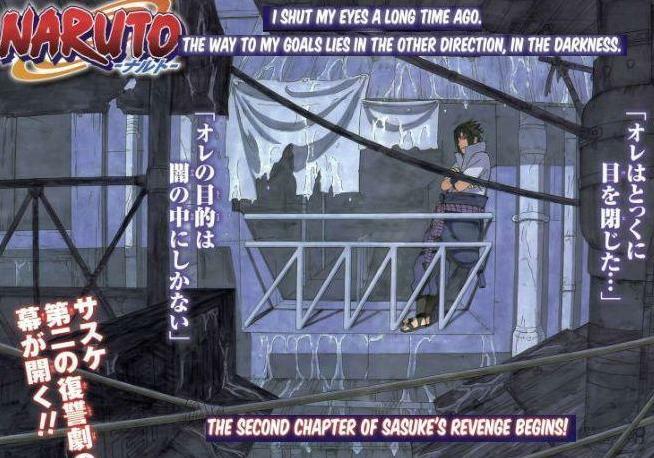 Silver Uchiha say: Good News…. NARUTO 476 is available !!!! MANGAREADERS get it pretty fast! Inaruto.net got the same translation online. May be not the better one will be find later in onemanga. Naruto chapter 457 is out !!! For more than half a century, the powerful Madara Uchiha has lived in the shadows and tireless has been preparing for war. He has been forming an army, gathering intelligence, planning, and adapting to assure success. Madara follows the rules of “The Art of War” written by General Sun Tzu 2000 years ago. He kept his identity in secret. He only mobilized black ops at the beginning. 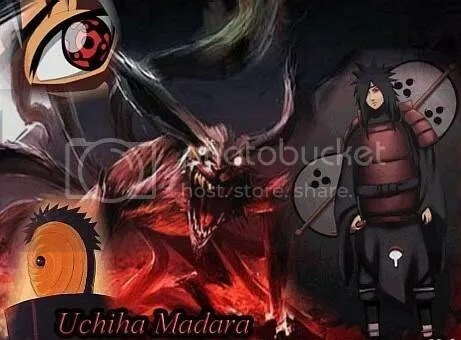 Madara has also stored weapons, food, and money; destroyed the Leaf’s alliances; and is forcing the enemy to miscalculate. Only a few more steps and Madara will go to open war. But does Madara share Tzu’s goal? If so, he only pretends to want the unification of the shinobi world, to build an Empire, and bring peace between the tribes. To this point Madara has only used only a small part of his forces, his special ops units: Akatsuki and the “Seven Swordsmen of the Mist”. These “black ops” gathered intelligence and money in order to prepare a huge army for the war. At the same time, it weakened several countries, created political uneasiness, shaked Konoha’s alliances, and created openings to allow him to slowly take over other villages in secrecy. To accomplish that mission, the special forces worked as mercenaries for any nation at the cheapest cost, thereby reducing the mission and profits of the enemy Hidden Villages. The fact that the black ops moved in pairs proved that they intended to cause minimum collateral damage for the sake of future alliances. Later they captured 7 of the 9 tailed beast, and thus obtained the greatest resource of chakra, and diminished the military power of the enemies. First Madara bribed, seduced and subdued ninjas to create the criminal organization Akatsuki. The 10 main members were powerful shinnobis from the Hidden Villages in the: Mist, Rain, Leaf, Rock, Sand, Grass, Waterfall and other unknowns. These 10 Akatsukis bear Rings that can probably canabalize the chakra of the tailed beasts and seal it in a statue. It is a bit like The Lord of the Rings, nine rings to nine humans that turned into nasguls, and “one ring to rule them all and in the darkness bind them”. 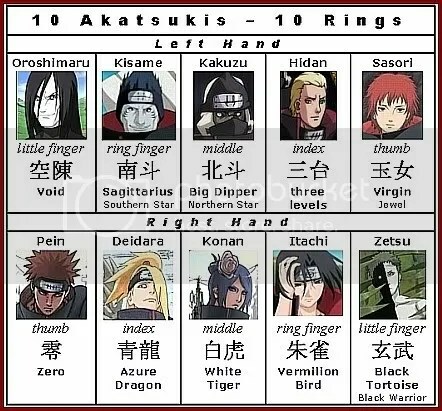 Four of the Akatsuki’s rings represent the creatures called the “four guardian spirits of Japan”, those were assigned to Deidara, Konan, Itachi, Zetsu. These elites of Kirigakure acted as black ops paired with external elements (Zabuza-Haku, Raiga-Ranmaru, Kisame-Itachi). 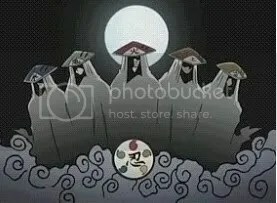 Kisame is an Akatsuki. Later Madara assumed the role of Mizukage, leader of Kirigakure. See Part 1. Therefore he is the commander of a ninja army, and leader of the remaining “The Seven Swordsmen of the Mist” that has been operating undercover as missing-nin in order to protect the Mist’s status. Taka the team led by Sasuke Uchiha is the last special unit recruited by Madara. 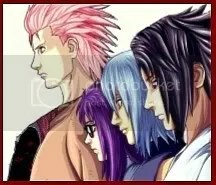 Among Taka is Suigetsu, probably one of the Seven of the Mist. Madara’s main forces remain a secret, but must include a full army of the Mist, and several other countries. He seduced and took by force several shinnobi villages. A good example is the Rain Village. Pein, the captain of the Akatsuki and possessor of the Rinnengan, is the current leader of the Rain Village. I believe other major countries such as Rock and Lightening are now allied to Kirigakure. And I wonder if Zetzu is a Kage or a Feudal lord. Kirigakure, the Hidden Village in the Mist, is one of the five greatest shinobi establishments. Therefore its leader Madara is one of the five Kages, the Mizukage (Water Shadow). The other four Kages belong to Konoha, the Sand, the Rock and the Lightning. To assure victory in war, Madara has been gathering intelligence about the geography, village organization, and abilities of potential enemies. For this purpose he has a web of spies. Also, he used the Akatsukis as sources of information, and to record battles. 1) Common citizens of Konoha are spying for Akatsuki and Kirigakure. Also Madara uses nin-cats: one of them was spying when Sai received his Root’s orders to kill Sasuke. 2) Leaf shinobis work for Madara or his crew, similarly to how Yura of the Sand reported to Sasori. Who is the traitorous ninja in Konoha? 3) Double agents, originally loyal to Konoha, turned by bribe or seductive manipulation. They give up the identity of the Leaf spies and misinform Konoha. 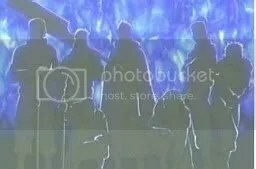 The day of the attack they will lead Madaras’s troops through the Leaf’s security. Can you imagine who the traitors are? 4) Dead (Ex-) spies who spread misinformation that leads Konoha to miscalculate. Kabuto was an Internal Spy for the Akatsuki, but he turned into a Double Agent reporting to Orochimaru. He (as an Dead Spy) gave Naruto a book of information about the Akatsuki, this probably contained some facts but also false info that will lead Konoha to miscalculate Akatsuki’s movements. 5) Living (Active) spies: the allies who infiltrate among the enemies and get back with information. This may be the case of Suigetsu among Taka. See Part 2. Can you imagine who are the spies working for Madara? Open warfare will not occur until Madara has secured such a power to crush Konoha swiftly. He has almost accomplished that. After the capture of the last bijuu, Madara will possibly try to “destroy credibility and union” of Konoha. The trustworthiness and wisdom of the leaders is crucial to keep a nation united against enemies. If Madara can corrupt the public image of Konoha’s elders, he can create an opening to break that union. Sasuke can help Madara if he announces the truth about Itachi. Another move that we can expect is the “diversion”. Madara will try to divide Konoha’s forces, drawing as many Leaf ninjas as he can to the wrong direction so they will leave Konoha and Naruto unprotected. He can Use Pein and the Rain Village as bait. Madara seeks a swift victory; a war that causes less collateral damage to the ground and villagers. Otherwise he will compromise his victory and the stability of his government afterward. Contrary to Pein’s ideal of destroying the world to build a new peaceful era; Madara will try to preserve as much as is possible. He wants to both win and stabilize his power at once. Nobody except Madara knows his true goals. A good general never tells more than what is necessary so as to avoid betrayal or failure. Nevertheless, Madara’s preparations confirm that he wants more than revenge or the post of Hokage. He wants to build an Empire. * Madara raises his armies and the bijuus against the Leaf and the Sand. After a swift victory, he offers trust and unites the shinnobi villages under one banner – the birth of an Empire. Something that will bring peace just like the Hashirama-Madara alliance did in the past. But in this new era, there would not be greater and lesser villages, because the Imperator will make them equal. Madara can be working for someone else, like a demon, or a Daimyo. In this case Madara won’t seek to become Imperator. Another option is that Madara is the boss and mastermind of this war. 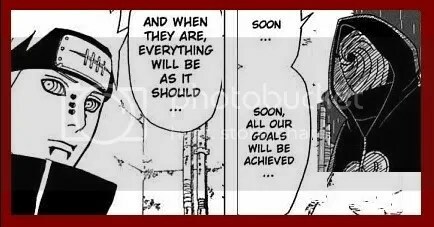 His goal must be then to make himself an Imperator, or pass the post to Sasuke or another Uchiha. And thus give the name Uchiha the supremacy that he thinks it deserves. Madara’s actions were all meticulous calculated, even the death of the several Akatsukis which he claimed was acceptable. They only initial misculcation was Naruto’s “way of the ninja” and his influence over the youth of Leaf and Sand. But right now Madara understands this perfectly and has adapted. The great question is: Will Naruto mature and grow his powers enough to shake Madara’s plans? Naruto Chapter 449 is out !! Some have die, others are coming back. A new arc is about to start. Enjoy Naruto 448. Bye the way…. Can you Believe it? Naruto is about to turn 10 years. The first chapter was published in Japan in 1999. Naruto reminds on the top of popularity on the net, while in Japan has lost the top post compared to One Piece and others ongoing tales.